With Henry, I had absolutely no idea what Montessori was before he was around 13-14 months old. He was around 18 months when we really started to shift our home in a Montessori direction. With Nora, we have had the opportunity to do things differently from the start. As I mentioned when I was pregnant we purged all the baby toys -- getting rid of anything with batteries. It's been nice not having a constant barrage of flashing lights and music. At this point, Nora's toys consist of a few wooden rings, rattles and some fabric lovies. We also made a decision about whether to incorporate a floor bed or not. We compromised and have a floor bed for play and a crib for sleep. We're currently room sharing, so she doesn't actually sleep in the crib, but will eventually move. She does, however, use the floor mat quite a bit. She has loved staring into the mirror and at her mobiles! Another favorite, has been the series of black and white paintings I made for her changing table area. As Nora gets older, I'll replace these images with pictures of people or places. One thing we've focused on with Nora has been giving her the opportunity to develop concentration by waiting for her to be complete before moving to another activity. So, for example, if she is staring at the images on her changing table, but I'm done changing her, I will wait until she stops staring. Same with the mirror, mobiles or toys. Instead of rushing her off, I let her finish her "work" before moving to the next thing. It does take a little more time, but never so long to interrupt what I need to get done. I'm by no means a Montessori purist, so we do have some things that probably wouldn't fit with a purist's idea of how a baby should be raised. For one, we use a bouncy seat and swing. While I do babywear a lot too, I still need the convenience of placing Nora "in" something. Plus, she loves the bouncy seat, and seems to be a baby that needs a little space from time to time. She's less into the swing, but in a pinch it's a good place for her to nap. Black and white images. I actually wish we had a few more of these around the house. A low hanging mirror -- this has provide a LOT of concentration from Nora. Love how you take the time to respect Nora's developing concentration!!! 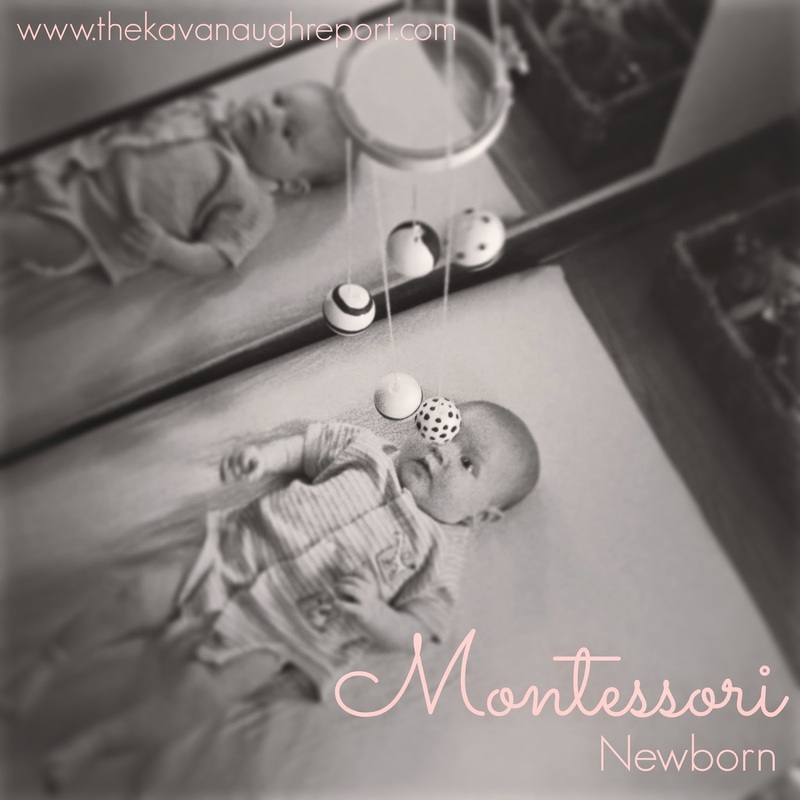 Thank you for sharing your Montessori journey with your newborn. Sounds like you're really enjoying her! How inspiring - I have to admit I have been sooo slack at incorporating anything Montessori for Evie, the last 6 weeks has been more about survival with her & her brother ;) thanks for the easy to follow post, I'll get on it! This is a great post. i found that information on Infant Montessori methods proved to be the hardest to find. Ultimately we respected the child, which when it comes down to it, is at the heart of Montessori. I love the mobiles. Quentin loved the Gobbi the best. Can you share where you purchased your floor bed and sheets for it? Excellent post. The information in this blog is extremely useful for the baby's mother. really awesome for new mother . where have you bought floor bed ? please I want to know.